According to MLive.com US Coast Guard's site says, "No ice is safe ice especially this time of year. The ice is certainly deteriorating and breaking up." Earlier this month, fifty-six percent of Lake Michigan was covered by ice. The town of Petoskey in Michigan had attracted hundreds of people when a life-sized statue of Jesus Christ on the cross submerged in Lake Michigan became visible. Man Walks on Frozen Baikal Lake in Russia, the Deepest Freshwater Lake in the World- Watch Stunning Video From Siberia. The shattered ice formation was caused by water moving underneath the ice making different patterns on the top. 56 percent of the lake remains frozen. The temperature in Lake Michigan has 23 degrees during winter. This winter put up mesmerising shows at various places across the country as the temperature dipped below zero degrees. The Niagara Falls located on the US and Canada border looked stunning as most of its water froze. However, winter also brought along different issues. 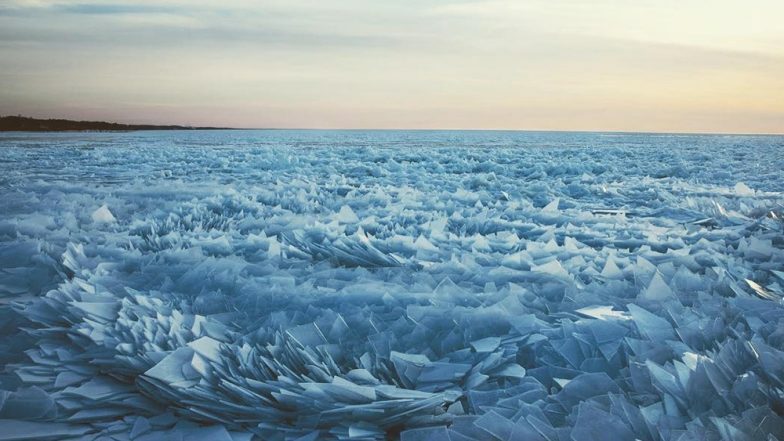 Strong winds blew up ice bricks over Lake Erie in North America. Traffic had to be halted and residents were asked to evacuate. In India, Srinagar's Dal lake as the temperature dropped below average. Hill stations in Himachal Pradesh Uttarakhand continue to witness fresh snowfall.